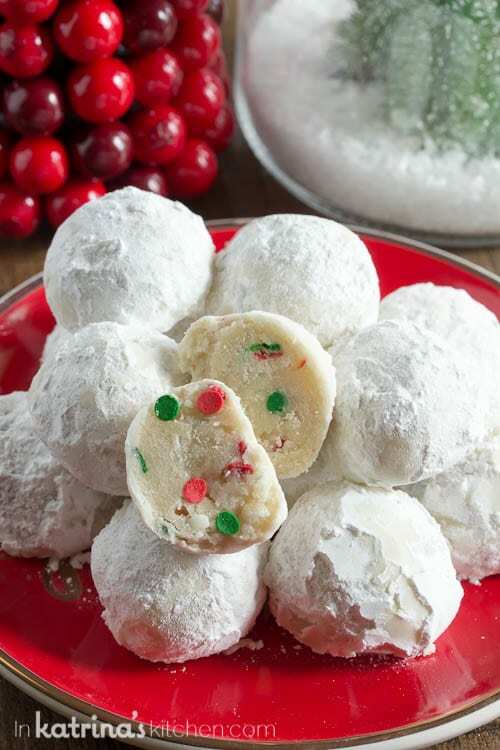 Bring these nut free Sprinkle Snowball Cookies to your classroom party or Christmas cookie exchange. No nuts means many more can enjoy! 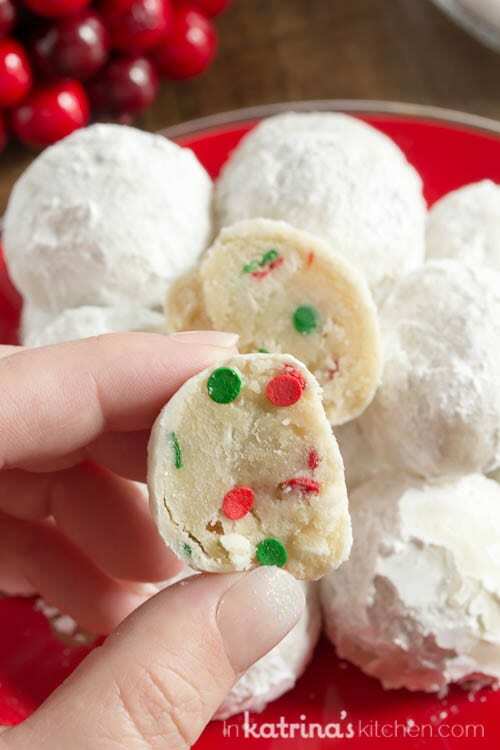 We’re going to get to these super easy and festive Sprinkle Snowball Cookies, but can we talk about food allergies and Christmas cookies for a minute? IT’S THE WORST! Even the safest places I now have to be alarmed and on the lookout for potential hazards for my son. In fact I decided to make these cookies after a few close calls and frustrating incidents over the past 2 weeks. As a food-allergy mom I thought I would address some allergy issues that often come up. We actually LOVE when you take a thoughtful moment to call or text us questions about what is safe for our children. Not only are we relieved for our children’s safety but we are grateful to your special attention to detail and care. As moms who send our kids into the big bad world of all things food just knowing that there is another person out there pausing to think of the safety of our children means more than you could ever know. Answering food allergy questions is never an inconvenience to us and we’ll probably hug you the next time we see you. Before I was a food allergy mom I wouldn’t have even known what kinds of questions to ask. I’ll list just a few here to get you started. Also, please remember all allergies are very specific to each child so never assume, always ask! Would you like me to text you a picture of the ingredients list on these store-bought cookies/cupcakes/cakes/etc? YES THANK YOU SO MUCH! Those are just a few questions to get you started. Now as a parent of a child with a food allergy I have to just tell you one little story that came up this week. My son is amazing at identifying his food allergen (peanuts). He works hard at reading packaging labels and he usually remembers to ask an adult for help navigating food choices. But food is EVERYWHERE this time of year. Everywhere you turn it seems there are life-threatening choices to be made. It’s scary, ya’ll! Last week at church he picked up a traditional “kiss cookie” (the kind with a chocolate kiss on top). He knows that plain milk chocolate Hershey kisses are safe for him so he grabbed one. Queue my panic when I practically leaped across the room to take it from him. What he didn’t realize is that these cookies are typically made with peanut butter in the batter. Thankfully all was well that day and we didn’t have an emergency. But it got me thinking about how I can do a better job at empowering him to make food choices even at his young age. While I always make safe treats for him at home I need to remember to tell him that these particular cookies are traditionally made with nuts. 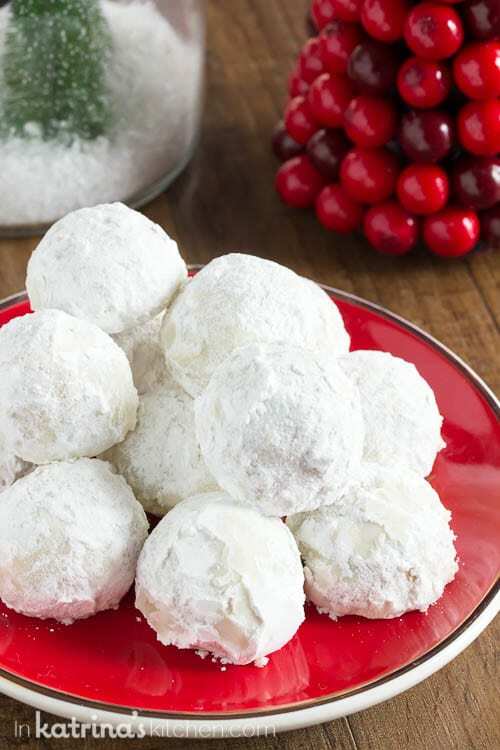 He has always wanted to try snowball cookies (Russian tea cakes, wedding cookies, etc). 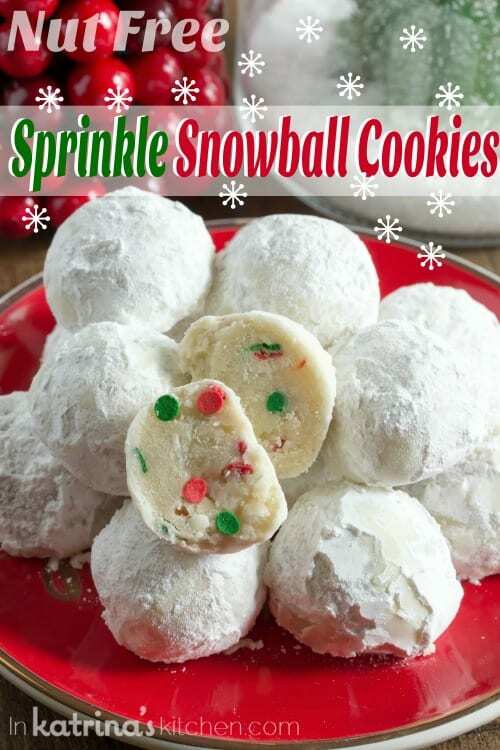 After having a discussion about these containing nuts we decided to make a Sprinkle Snowball Cookie with sprinkles that I know are safe for him (always check and read labels!). You could just as easily omit the sprinkles altogether, but I thought they would make a festive addition this time of year. Preheat oven to 375°F. Line cookie sheets with parchment paper or silicone baking mat. Mix butter, 1/2 cup powdered sugar, and vanilla with an electric mixer. Add flour and salt and mix until a smooth dough forms. Stir in the sprinkles. If dough is too soft, chill it until you can work it easily with your hands without sticking. 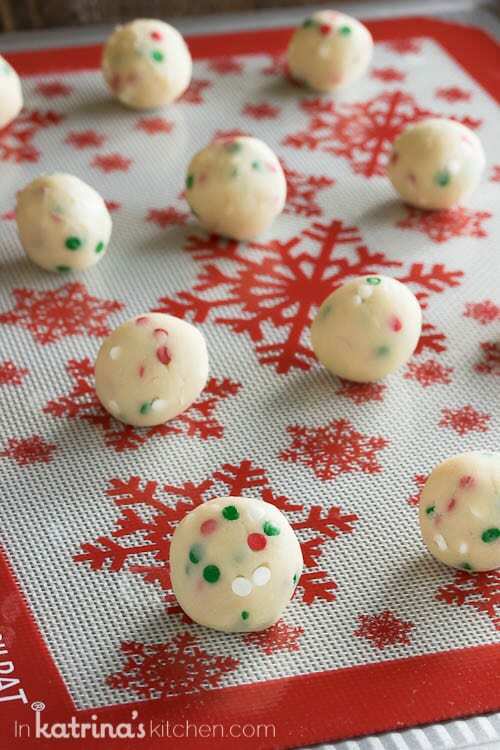 Scoop dough into 1 tablespoon portions and roll into balls. Place on prepared cookie sheet. Bake cookies for 7-10 minutes until bottoms are just slightly golden. Remove from oven and cool for 1 minute until you can handle them. 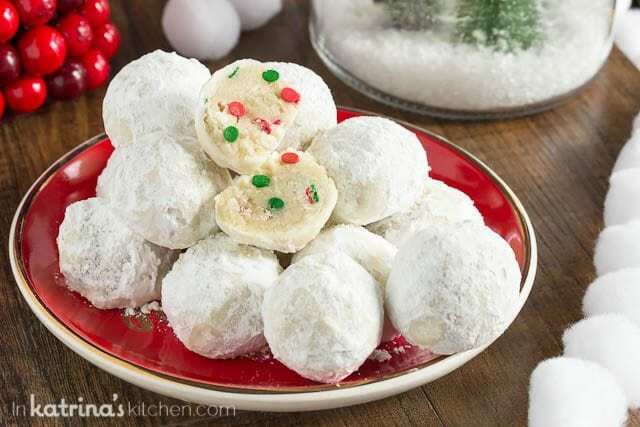 Drop into a bowl (or gallon size zip top bag) of powdered sugar and roll each cookie in the sugar until coated. Place on a rack to cool completely. Re-roll in powdered sugar before serving if desired. Store in a sealed container.